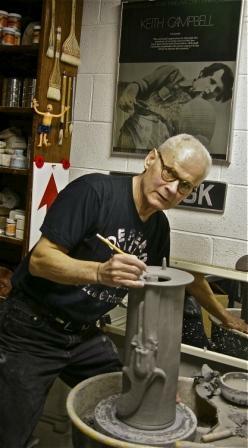 Studio Ceramics Canada has posted a major page update on ceramic artist Keith Campbell. This new page more fully explores the range and changes of Keith’s work over the years since 1967, from his student works, through the elegant formality of his porcelain works of the ’80s and ’90s, to the humour and social and historical commentary of his most recent works. Enjoy the images of and the insights into the work and life of this major Canadian ceramic artist. By the way, the poster on the wall behind Keith is of a 1976 poster for the Ontario Craft Council Individual craftspersons exhibitions. Typically Keith the image inserts an historical element into a current image. click on it for then and now images. Artist page updates such as Keith Campbell’s will occur as new artist information and images are obtained. Enjoy the flexibility and currency of the online world. This entry was posted in Ceramics on May 20, 2014 by Barry Morrison.